Same great race course, thousands of excited fans, top level participation and one-of the richest $12,000 Pro Women’s cash purses in Southern California history with all proceeds helping charities and the local community. The USA Cycling National Criterium Calendar (NCC) race on Sunday, May 3rd, will once again attract the nation’s top international and domestic athletes to the beautiful Pacific Coast community of Dana Point California. 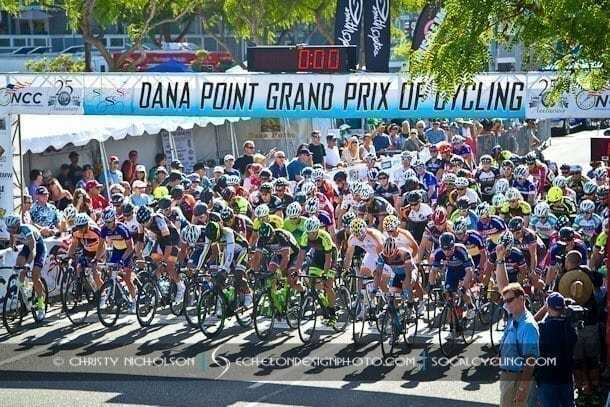 The Dana Point Grand Prix of Cycling is recognized as one-of the largest participant 1-day criteriums in the United States with projected temperatures for the Sunday May 3rd event to be a perfect sunny and warm 70*. The famous DPGP six turn L-shaped 8/10 mile criterium course will once again wind through pristine neighborhoods overlooking the beautiful Dana Point Harbor finishing again at Town Center. The race course offers ample areas to view and cheer our nation’s top cycling athletes with amateur racing set to begin at 7:00 am, followed by the $12,000 prize purse Pro Women’s NCC race at 1:30pm and then culminating with the nationally recognized John Johnson Pro NCC Classic race at 4:10 pm. This year’s 9th Annual DPGP Featuring the Pro Men’s John Johnson Pro NCC Classic and the $12,000 Pro NCC Women’s Race is gearing-up to be one of the most competitive to date, confirmed athletes and teams for the NCC DPGP include; current 2015 NCC point’s leader Hilton Clarke leading his Pro-Continental Team UntitedHealthcare with 2nd and 3rd place points leaders team mates, Luke Keough and Carlos Alzate Escobar – For the Pro Women, confirmed to compete will be Team Colavita/Bianchi pb Fine Cooking led by NCC 2nd place points leader, Erica Allar. The pro men will be also vying for $12,000 in total cash that always delivers the best highlights for the National Criterium Calendar and the Southern California racing scene. Dave Towle, the voice of American bicycle racing will again be announcing the action in the booth and will be joined by Dana Point hometown hero, Olympic Champion and Bicycling Hall of Fame Inductee, Steve Hegg along with Roger Worthington, Founder of the Dana Point Community Cycling Foundation, organizers of the DPGP. We’ll have plenty of refreshments and food for a beautiful warm sunny day, something for the whole family; the 1st Turn Sierra Nevada Experience featuring an excellent selection of beer from one of the nation’s leaders in craft brewing, with food and ringside viewing of the action alongside the fence at turn #1, and our 5th Marine beer garden on the finishing straightaway with both Sierra Nevada and Karl Strauss beer. If you like great beer, food, warm sunny weather, beautiful scenery and top racing action, you’ll love the DPGP and all proceeds benefit charity. FREE Kids Events with a safety interactive course compliments of the Orange County Sheriff’s Department at the Boys & Girls Club Kids Zone with; demonstrations, displays, face painting and great food and of course, our highly anticipated Kids Fun Rides with FREE goody bags, t-shirts and surprises. Every child receives a cool participation medal after negotiating the same great race course as the Pro’s! We’ll again have the Fan Zone Expo, catch the race action with our expo vendor participants as they display great products and services with free giveaways alongside the race course with ample viewing of the racing action, you won’t miss a thing. DPCCF/DPGP President and organizer, Brad Fowler; “The DPGP is made possible by the endless hours by community volunteers who are proud to be associated with our well managed nationally recognized criterium. We want to thank the City of Dana Point for allowing us to take over the Town Center streets for a day so we can showcase the best athletic talent in America. We’ll again anticipate huge crowds in warm 70* weather, perfect for our free kids activities, exciting racing action, and most importantly — a chance to give-back to the community by contributing to the Boys & Girls Clubs of Capistrano Valley and the 5th Marine Regiment Support Group”.